Matthew Moves Ahead, the third book in the Matthew in the Middle series is now available on Amazon! After three long years of waiting, Matthew Vos is finally going to the Cadet International Camporee! He’s earning money to buy supplies, but the lawnmower slips from his grip and cuts through a customer’s garden. Matthew’s hopes wither like the sheared-off plant tops. What more could possibly go wrong? And will the Camporee turn out to be all he’s imagined? I love this kid. Of course, I love Matt’s fondness for The Accidental Detectives books, but I also love his humorous voice, active imagination, and fledgling faith. Glenda Faye Mathes crafts vivid scenes and authentic dialogue that draw me into the story and into Matt’s head. Because Matthew Moves Ahead in realistic ways that reflect universal childhood disappointments and joys, readers will love Matthew, too. ‘He leaned over the table and contorted his face like speckled Silly Putty.’ This playful line (one of so many) from Matthew Moves Ahead aptly demonstrates how well the author pegs fun, insightful, and altogether natural word pictures. Reading through a brief period of Matt’s everyday life is much like living a brief period of your own. The young boy in the heart of Glenda Faye Mathes is us—and he comes to life with rich and believable detail, warmly testifying to God’s love in real time. What an adventure! 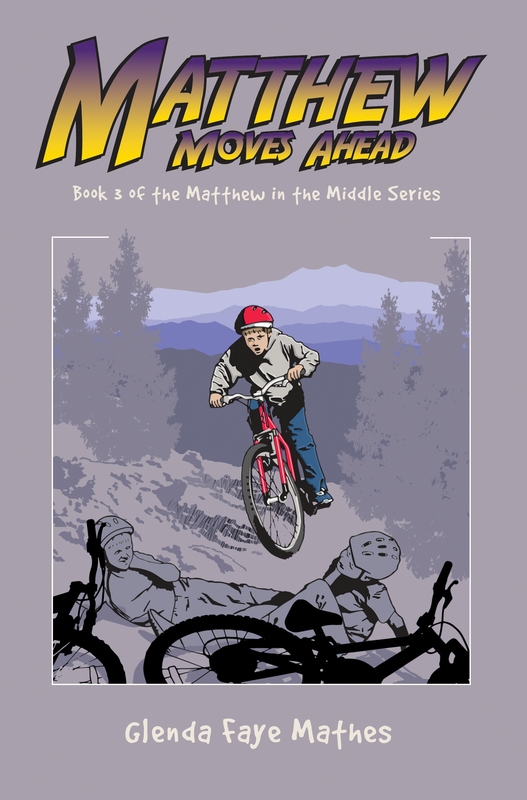 Matthew Moves Ahead is a delightful story and a great addition to the library of any young boy, especially a Cadet who has actually participated in an International Camporee. Glenda Faye Mathes has obviously done a lot of research and accurately portrays Kamp Kananaskis details, even down to menus and devotions. The characters develop well as the story progresses, and the reader will see Matthew’s cadre grow into a unit of close friends by the week’s end. All in all, it’s a tale well told. I’m thrilled and thankful for these amazing endorsements from men with specialized expertise. And while I’m a little sad to bid adieu to Matthew, I’m happy to announce this final novel’s availability. The Matthew in the Middle series is aimed at middle grade readers, ages 8-12, but can be enjoyed by any age. Other novels in the series are Matthew Muddles Through and Matthew Makes Strides, both also available on Amazon. In the course of the series, Matthew develops relationships with people very different from himself. He discovers the pitfalls of being a hero and how to overcome fear and anxiety. And he grows in his faith as he lives more and more for Jesus.